Conveyors are the handmaidens of high-volume production. They lack the complexity of high-speed mixers and steam-jacketed kettles, but without conveyors, machine processes would become discreet processes, leaving manufacturers scrambling to transfer work-in-progress to the next step. In years past -- and, in rare cases, the present -- that transfer was done manually, adding the potential for human contact. Minimizing human interaction with the product is part of the justification for today's automation projects. As a consequence, conveyors and their belts have been the focus of continuous improvement in hygienic design and cleanability. 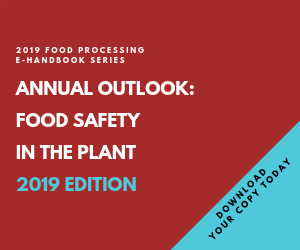 "When a product goes from a transformational process to a conveying process, that's where you have exposure to food safety risk," observes John Kadinger, marketing manager at Key Technology Inc., Walla Walla, Wash. In recent months, the firm has introduced several enhancements designed to improve sanitation and reduce maintenance of its vibratory conveyors, the latest being the replacement of mechanical drives in its Iso-Flo line with a concentric electric motor mounted to the unit's bed. The change eliminates lubricating oil and frayed drive belts in the food handling zone. Frayed belts are a top-of-mind concern at Ellison Bakery in Fort Wayne, Ind. Soft cookies are the company's hallmark, but a significant part of Ellison's business involves wafers for ice cream sandwiches. Keeping foreign materials out of the product borders on an obsession, and the firm is zeroing in on bits of conveyor belting mixed in with finished goods. "Food safety concern is always growing," notes plant manager Jon Ellis. "How do we stay ahead of the curve and address issues before customers raise them?" Lately, the answer has looked like a vibratory conveyor. "Cloth conveyors tend to fray," says Ellis. "We want to eliminate all the risks." A vibratory conveyor might not be the best choice for baked goods, but a horizontal unit that gently slides product could be a solution, says Kadinger. The speed of horizontal conveyors can be modulated, compressing more product in less space as needed. For baked goods that must cool before packaging, that can mean a smaller footprint than a conventional belted conveyor, he points out. On occasion, conveyors are integrated into the "transformational process," as is the case with ovens fabricated by Auto-Bake, a Sydney, Australia, firm. Auto-Bake partners with Dunbar Systems in suburban Chicago to deliver integrated systems for high-volume production. Real estate availability can scuttle an installation, points out CEO Amanda Hicks, and the OEM's solution is serpentine oven belts that shrink an oven's linear footprint to almost a third of what's needed for a conventional oven with comparable capacity. Another Auto-Bake innovation is an infeed design that allows bakers to remove depositors and other ancillary equipment for cleaning while swapping in duplicate components without a production break. Engineers also have eliminated many of the transfer points typically found in integrated lines. "That's where things go wrong and you have product damage and downtime," says Hicks. Automated production comes to an abrupt halt when seamless product transfer doesn't occur, which elevates the humble conveyor to the status of critical component. A concerted effort has been made to improve the sanitary design of belts and frames to eliminate harborage areas and optimize cleanability. Ashworth Bros. Inc. eliminated a bridge weld with open areas around the weld and rod end because of the potential for food debris to be trapped, replacing it with a zero-tension buttonless weld. The firm also created a metal/plastic hybrid belt for spiral freezers that convey sticky products that are difficult to release from a wire mesh surface. "The majority of our belts are used in both meat and baking applications," explains Kenneth King, commercial support manager at Winchester, Va.-based Ashworth. Dorner Manufacturing Corp. had the same processing segments in mind when it introduced a stainless steel, tool-less belt slacker unit called AquaPruf. The Hartland, Wis., supplier upped the ante seven years ago with a high-pressure washdown version designed to meet American Meat Institute sanitary principles. The system generated good adoption in meat & poultry, but indifference in baking applications led to a simplified, more economical version. "We are selling some sanitary conveyors (to bakeries), but it is typically to higher end customers and only for a specific application," marketing director John Kuhnz wrote in an e-mail. "FSMA has not impacted the bakery industry as of yet." That view wins grudging agreement from John McIsaac, vice president-strategic business development for Robert Reiser & Co. in Canton, Mass. As a member of the American Society of Baking's committee charged with upgrading the voluntary BISQ standard, McIsaac sees a disconnect between what customers are demanding and where mainstream bakers are at in terms of sanitary requirements. "I'm not convinced (sanitary design's) a priority in the bakery world," he confides, "but the ones who make it a priority are our target customers." If it isn't a mainstream priority yet, it will be, predicts Jill Batka, president of Dynamic Conveyor Corp, Muskegon, Mich. The fabricator of V-style conveyors branched into the baking world a few year ago with an easy-disassembly version of its conventional conveyor. The units use solid, extruded thermoplastic belting that doesn't slip or fray. In a factory field comparison with interlocking belts, the solid thermoplastic belt reduced cleaning cycles to 13.5 minutes vs. 21.6 minutes and water use to 105.9 gallons vs. 190.7 gallons, the belt's designer reported. Safety extends beyond food products and includes the people who work in plants. Explosions are a worker risk that became top of mind in the wake of 2008's fatal accident at Imperial Sugar's Savannah, Ga., mill. The disaster killed 14 and badly injured scores of other workers. A cascade of explosions caused the most devastation, but the blasts were triggered by an equipment explosion. Minute sugar particles pose a particular risk of ignition in a confined space, but many food particles, including flour dust, are below the sub-420 micron threshold for explosions. Unfortunately, National Fire Protection Assn. standards for explosion prevention can leave plants vulnerable when transporting flour, maintains Nick Hayes, president of Volkmann Inc., Bristol, Pa. The standard excludes confined areas of less than 8 cubic feet. "That's not adequate," Hayes insists. "I don't want to be standing next to a 65-gal. drum when it explodes." The manufacturer of vacuum conveyors is the first supplier in its category to receive ATEX certification for explosion proofing from TUV, the German equivalent of Underwriters Laboratories. Metal-to-metal contact can ignite fine powders, Hayes says, and European standards account for that potential, whereas U.S. standards do not. Besides explosion proofing, his vacuum conveyor features all-stainless construction and a dense-phase vacuum system that results in less product degradation. Explosion risk was not on Mike Sylver's radar when he installed a Volkmann vacuum conveyor early this year in his Las Vegas food plant. "We're BDZ kosher certified, and you can't meet that standard unless your equipment is more than pharmaceutical grade," claims the CEO of Just Like Sugar, a GRAS approved sweetener. Instead, materials of construction and equipment reliability shaped his purchase decision. "It's like a Rolex watch: it does exactly what they say it will do," says Sylver. Food processors employ a wide variety of conveyors to keep product moving from point to point. The expectation for all of them is reliability and design features that enhance safety and minimize risk.